Hello Everyone! Welcome to Studio Katia September 2018 Release Blog Hop! You should have come here from fabulous Rubeena. Your next stop is wonderful Kaja. For this Blog Hop I created a card and a tag using New A Cup of Thanks Stamp Set and Dotted Patterns Set 3 Creative Dies. I coloured image on both my card and the tag with Polychromos pencils. I wanted to make them fun and cheerful, so I decided to go for a yellow background. I used coordinating die to create a mask. I used Mustard Seed distress ink to ink blend background on the tag. For the card I wanted a little different look, so I only used Mustard Seed on bottom portion of my card, using a strip of masking paper to create a sharp straight line. For the top part I decided to use Lemon Zing ink by SimonSaysStamp and brayering technique. Now, there is not a huge result here, as I wasn’t going for a bold background but rather cheerful, so I only went over my panel few times to have that slight gradient of yellow from darker (not dark, just slightly darker ;)) to light. I don’t know about you, I usually think of a sentiment in the very last moment. Well not this time. Before I started brayering my background, I die cut word thanks (which is a part of coordinating die set and I love that Katia ads sentiment dies to coordinating sets) out of the masking paper and adhered at the the top right corner of my card panel. After my background was done and I lifted the mask, I got a white word thanks on the yellow background. I love how it looks! I didn’t want the sentiment to steel attention from my gorgeous teacup with flowers and I think this did the trick. 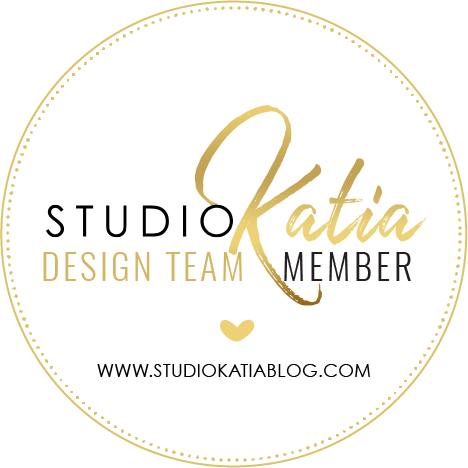 To celebrate Studio Katia is giving away TWO $50 CAD Gift Certificates every day of the Blog Hop! Youcan read all the details on You can also win a $25 GC to Studio Katia Store on my Blog! Leave a comment here on my Blog for your chance to win and come back September 30th, to find out if you’re the winner. What a beautiful card! I love your sunshiney background. Stunning cards. Your coloring is beautiful. I just bought a small set of Polychromos pencils and I've been practicing with them. While I have a long way to go, you give me hope! They are gorgeous. Thanks for sharing. on the card is stunning!!! Awesome Liliya, I love the vibrant colours from the yellow background and your gorgeous flower colouring. It is absolute a awesome card and tag, thank you so much for sharing. Pretty card and tag. Great colours. You've used some deep colors that are so pretty. Both tag and card are lovely. Adorable card! Love, love this!!! Liliya, your coloring with these pencils is fabulous, love that bold yellow background on card and tag. The image really pops! I love that floral teacup! The bright yellow background is gorgeous and offsets the colours of the flowers beautifully! Beautiful choice for the yellow background, it makes a nice contrast with flowers that stand out from the card. Beautiful beautiful projects! I love the pops of yellow, it makes it so happy! I love how the yellow background makes the beautiful image pop. Beautiful card and tag! Love the colors. Your card and tag are beautiful! I love that pretty tea cup bouquet! Thanks for the inspiration! You card and tag are so pretty!! There is so much to love in this Studio Katia release but I do have to say that the A Cup of Thanks is my favorite. 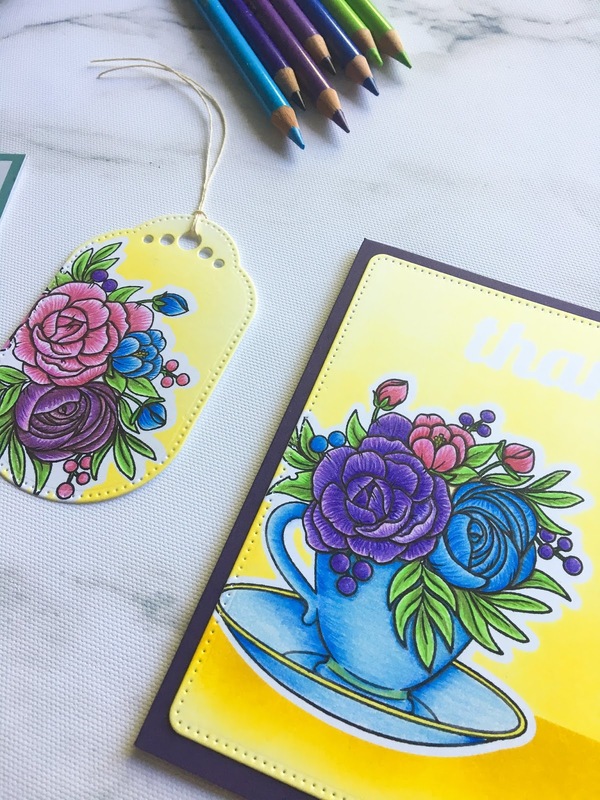 Your rendition on your card and tag are gorgeous, I love the bold colors! Thank you for sharing today and thank you for the inspiration. I love it, too, that Studio Katia includes sentiment dies with their coordinating dies! Way to go -- using a bold background color. That makes your card & tag very unique. Both are so pretty. Thank you! 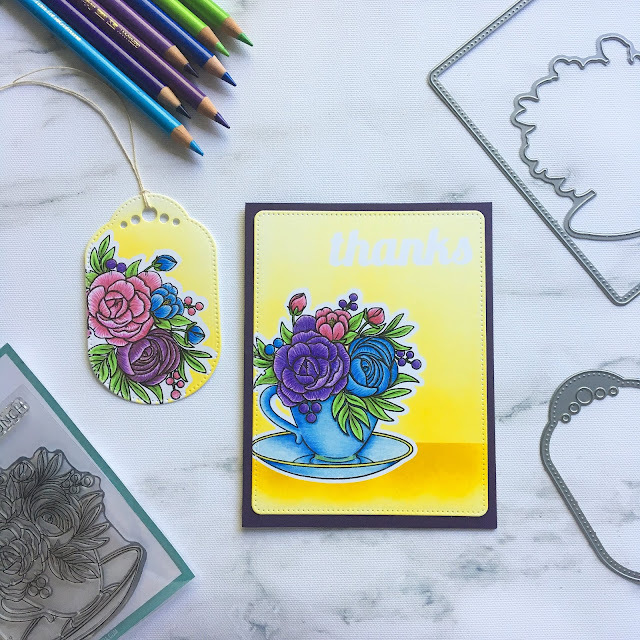 I really like the bold colors of your teacup card and tag. The purple and yellows look great with each other and the blue too. 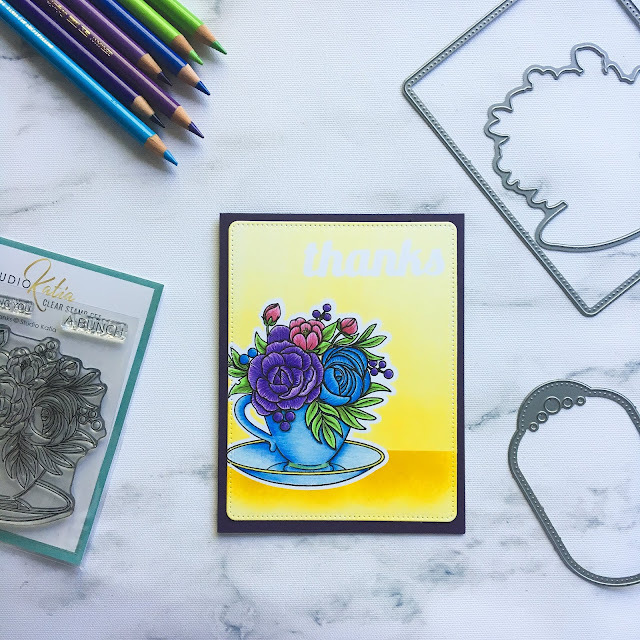 Thanks for sharing your version--because most of the time this type of stamp is more soft and I like the presentation of your card because you thought outside the teacup! HA HA. Really, a wonderful card and complimentary tag. Wonderful card and tag! So happy and vibrant. Amazing colored pencil work, love the texture from the pencil. So beautiful, I love both the tag and the card, and they’re so cheerful thanks to the use of yellow. I love the font of that thanks sentiment, too! Wow! Awesome creations!!! Your colouring is simply breathless!!! This is very pretty! The flowers look lovely against the yellow and I love the tag! So pretty. I like the cheery colors. Love you used teacup flowers on tag for completely different look! I love the inking on the background, so bright and lovely! Your coloring is beautiful. I love seeing the strokes that give so much texture to the flower petals. I also really like the idea of doing a matching tag and card. I never do that, but it's a great idea. Thanks for sharing with us!